Rama the divine hero of the epic Ramayana is the ideal man, the man par excellence of Hindus. He is the Maryada-purushottama. He had all the virtues which make a man perfect. He is an ideal son, ideal brother, an ideal husband and an ideal friend. He is perfect in every way. He loved His brothers as His own self. On the eve of His coronation to the throne of Ayodya, He missed His brothers Bharata and Satrugna, who were away with their mothers&#8217; parents. He feels disturbed at the news of His coronation. The very thought that He should rule the kingdom and His brothers should serve Him is revolting to Him. That is why when mother Kaikeyi tells Him in the presence of His father about the two boons she had asked him, He welcomes the idea rather than perturbed over it. He thus demonstrates to the world that one should neither rejoice nor recoil over favorable or unfavorable things. A mere hint from His step mother is enough for Him to give up His rightful claim for the throne. Instead of resenting the behavior of Kaikeyi who is instrumental in sending Him to exile, He rejoices over the prospect of meeting the sages in the forest and happy to carry the order of His father and wishes of His stepmother. He feels happy to think that the throne will go to Bharata who is dearer to Him than His own life. He takes it as a piece of good luck and proceeds to forest with out seeking any confirmation from His father. In this way He has discharged His obligation not only to His parents but also to His brother proving Himself an ideal son and an ideal brother. Rama is the most tender hearted and compassionate by nature and had the greatest regard for others feelings and thoughts. He dissuades Sita and Lakshmana to His best from following Him and advises them to stay at home and serve and comfort the sorrowing king and queen mothers. But when He comes to know that they will not survive in His absence He allows them to accompany Him. After comforting his mothers He leaves to the forest consoling the crowd of men and women waiting to catch His last glimpse. He requests all who are present there to do their best to cheer up his parents during His absence. In spite of His request not to follow Him to the forest a large crowd of citizens follow Him. He leaves the sleeping crowd at Tamasa river where God made His first halt by saving the people from further toil and hardship. While ferrying across Ganges He asks Sumantra (who had been sent by His father and for whom He has the same regard as His father) to leave with loving and consoling message to His parents. When He meets Bharata and Satrugna at Chitrakut, He first meets Kaikeyi and consoles her with soothing words and throwing the whole blame on fate. Then He meets Sumitra and then only His mother Kousalya. He pays His respect to His guru and guru's wife. He shows His consideration to Bharata by giving His sandals to him. He teaches a lesson to Jayantha (who teases Sita with bad intention) by punishing him showing that a man should look other ladies like mother or sister. He shows His mercy for even for humble creature like Jatayu (an eagle which tries to protect Sita when Raavana abducts Her) by giving salvation. He conferred salvation to a woman (Sabari) for her devotion. He proves Himself an ideal friend by killing Vali for Sugriva. He is bound by Hanuman His devotee. He proves that in many incidents. We see His bravery when He fights with His enemies. He demonstrates to the world that surrender to the Lord is the best means of attaining salvation through the example of Vibhishana. Rama offered the same fortune to Vibhishana which Lord Shiva gave Raavana after offering all his ten heads in a sacrifice. He kills Raavana and gives Lanka to Vibhishana. 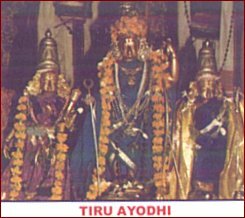 He returns to Ayodya with His wife and takes the Kingdom. Nowhere we can find a lord like Rama by whose grace we get supreme peace. Ramayana bestows both wisdom and devotion. It wipes out lust and impurity. Men who takes dive in to it are never touched by the burning rays of worldly illusion.